Our brink steam download product codes are back in stock again! At the brilliant price of just £25.99! CLICK HERE TO BUY BRINK STEAM DOWNLOAD £25.99 GBP – that’s just $39.99 USD! This activation code can be used on steam. The price is just awesome. I get the key in 12 hours. Got my key within the hour, good stuff. First key was a dud, but they replaced it in fairly short order. It isn’t instant by any means but they work on the weekends and for the price you can’t go wrong. Delivering was a bit long, but it works and it’s cheap!!! Got my key today and it worked fine. When I purchased Portal 2, CJS facebook status said they were out of keys. However, about 20 hours later, via Facebook, CJS told me that they have keys now and I can collect it. I had to ask CJS to activate my order for the procedure to get going. Facebook has become a customer service outlet now, which is fine, but I would like CJS to provide quicker response to emails than to rely entirely on FB. Anyway, CJS provided the best price of Portal 2 which is awesome. I will definitely buy from them again. There delivery was quick, I got the key in 2 hours. & activated instantly. If I buy now, will you send it in time for release? Can’t you send the keys now if you’ve got them in stock, since preloading is available ? im from israel if i buy this serial it will work here? and also how long it take to get for me the serial? Yes, this key will function in all regions and languages including Israel. The keys are in stock right now. The key works fine, and was sent very quickly! Thanks for the key guys! good speed, encountered a problem where purchase was not picked up in database, fixed within 4 hours by a member of staff. Overall very good service, product and price. Thanks! Received key within a few hours, key was PB banned so i emailed them and a few days later i got my replacement key and all was good. Will defiently be coming back. Thanks guys. good service, fast delivery, key works fine and the game is awesome. I definetly buy the next game at this shop. How would you like to get a Brink Steam Download Key for just $39.99 which is equal to just €27.99? CJS CD Keys are a leading game seller with a unique business model. What CJS CD Keys do is import the games in bulk from EU countries, and sell the brink product keys alone, without the retail boxes. Our customers only need the activation keys, as they can activate them easily on Steam, which will grant them to a brink digital download. Then all that’s left to do is download the game and play! Brink CD Keys that CJS-CDKeys sell are ideal for activation on steam, allowing you to download and play instantly after payment. The keys are in stock right now allowing you to pre-load the game ready for release date tonight! what’s more, the price is just $39.99 which is a brilliant price, and you won’t find a genuine code for this game cheaper anywhere else on the internet! Buy now today, and become another one of our thousands of happy customers! This is an amazing price, and not to be missed! What exactly will you receive, you ask? The Autokey system is our unique digital delivery system which allows our customers to collect the activation codes they purchased immediately after payment. The system is entirely automated allowing you to get instant delivery! Once you pay simply enter in your order details into Autokey and you will be presented with the activation code(s) you purchased. The codes for Brink come as a photograph, that means you actually receive a photograph of the activation code that is printed on the game manual. All of our items are taken from brand new sealed retail games, we sell the keys to customers and throw away the discs! This allows us to provide extremely competitive pricing, due to there being no shipping costs. Our Brink activation codes are EU keys which allow you to play in all regions and all languages. 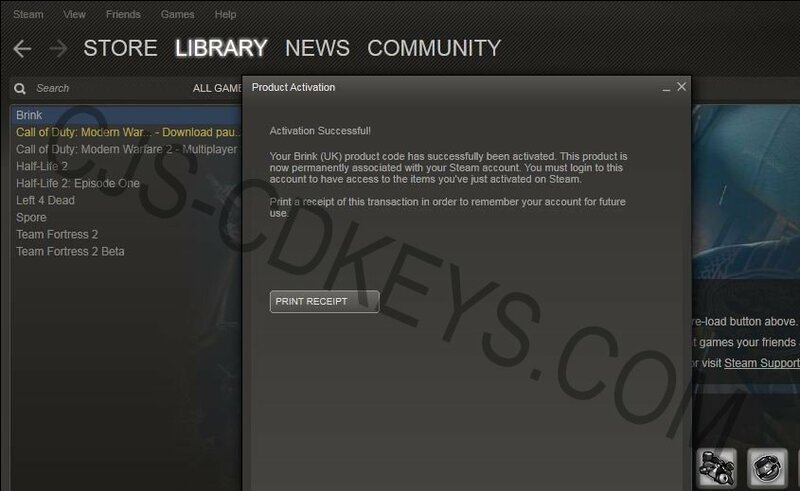 Once you have received your code, you can simply log into the Steam client (from steampowered.com) and activate the code with your steam account. Once that’s done, your brink product key will be permanently binded to your steam account, allowing you to legally download the full game and play on both single player and multiplayer, just as if you bought from a physical store! All of CJS-CDKeys.com products are backed by a money-back guarantee. Not satisfied with your item? we will replace or refund with no questions asked! We are proud at the fact that we leave no customer unsatisfied. Our email support is open every day of the week, and you can normally expect an email reply within 10-15 minutes! We have news that our Brink cd keys are expected to arrive in stock approximately 2 days before the official release date of the game. This means that you can start pre-loading the game up to 2 days before the release date, which allows you to immediately play the game upon release. Are you looking to buy brink? Did you know that instead of buying a boxed copy, waiting days for it to arrive in the mail, and then having the risk of losing or damaging your game disc, you can instead buy the game for a cheaper price the 21st century way.. By Digital Download! CJS CD Keys are offering a digital download key for Brink for just £25.99 – you can read more on their product page by clicking here. After you purchase the code using any one of CJS’s easy payment methods (google checkout, moneybookers) you can then head over to CJS-CDKeys.com/Autokey to collect the activation code from CJS CD Key’s Autokey system. This is a one-of-a-kind system that CJS boasts, which allows customers to collect the codes INSTANTLY after payment, rather than having to wait for staff to manually email the codes. Once you receive your code, you will notice that it’s an actual photograph of the brink product key that is printed on the game manual. You can then enter this key into Steam, a fast, secure, and easy service which allows you to download games (including brink) fast and easily. Once you have entered the brink product code into steam, you can simply press ‘activate’ and the game will be permanently binded to your steam account. Then you can begin your high speed download. Once downloaded, you can then immediately play the game on both single player and multiplayer, just as if you bought a boxed copy from a brick and mortar store! You can re-download the game as many times as you want! CJS CD Keys alone has served over 1.8 million unique visitors in the past year, and distributed tens of thousands of activation codes to tens of thousands of happy customers. Because of our amazing prices, we have generated a huge following, and a very large customer base. We have thousands of fans on facebook which regularly keep coming back to us because of our great service (become a fan yourself by clicking the ‘like’ link at the top right of this page). If you go to our main CJS-CDKeys.com website and click to read our reviews, you will be able to read thousands of reviews from happy customers, so you can rest assured with no doubt that your activation codes originate from authorised distributors within the EU. This means that you can buy worry free, and know that your code will function in all languages and in all regions. Many online key store shops sell chinese keys, which can be banned for cross-region registration, and often don’t work at all within the EU region. CJS CD Keys are proud to only buy directly from reputable game distributors in bulk, so that we can produce a 100% quality rate on our keys, and know for sure that our customers will keep coming back, again and again. All of our codes are unique, unused, and taken only from official sources. Our Brink CD Keys are currently at a price of just £25.99, which is cheaper than the £34.99 price of Steam! Brink is now available to pre-order at just £25.99 at CJS CD Keys! This is a fully genuine, Out-Of-The-Box Brink CD Key / Serial for steam! Delivery INSTANT via autokey system. • Not Just Another Hero – Brink’s advanced player customization offers a near-endless combination of looks for your character – allowing for the appearance of your character to be truly unique. As you progress through the game and acquire more experience, you’ll have even more opportunities for customization. • Two Sides to Every Story – Choose to fight through the single player campaign as either a member of the Resistance or the Security and then take your same character online to play cooperatively or competitively against other players. • Blurring the Lines – Take your unique character online at any time you choose! Brink allows you to seamlessly move between your single player campaign, co-op with friends, and intense multiplayer action. Multiplayer takes the story online where you can play with up to seven other people (or AI characters) cooperatively as you take on the opposing faction or with up to 16 players competitively. • Play SMART – Brink uses the familiar shooter controls that you’re used to, without frustrating, artificial constraints and adds a new feature: the SMART button. When you press the SMART button, the game dynamically evaluates where you’re trying to get to, and makes it happen. Whether you’re a seasoned FPS veteran or someone just getting started, you’ll be able to make more intelligent decisions during the fast-paced action with SMART. • Context-Sensitive Goals and Rewards – Objectives, communications, missions, and inventory selection are all dynamically generated based on your role, your condition, your location, your squad-mates, and the overall status of the battle in all gameplay modes. You’ll always know exactly where to go, what to do when you get there, and what your reward will be for success.